Basic Idea: Golden should continue to actively oppose the Jefferson Parkway and other efforts to add development-generated traffic to SH 93 and US 6. Could continue to block Jefferson Parkway construction indefinitely. Helps highlight the flaws in Jefferson Parkway concept, which won’t effectively reduce existing congestion but will promote new development and traffic. Continued substantial costs for engineering and legal consultants. If Golden is successful at blocking the Jefferson Parkway, it still won’t have significant funding to implement needed local transportation improvements. If Golden is unsuccessful, this could result in worst-case scenario of increased traffic and no funding for improvements or mitigation around Golden. Could result in continued or increased ill will from much of the region, which could restrict Golden’s ability to influence regional decision making. This is the side of the angels! Or will we continue to pave paradise to enable development of more shopping malls? We have been involved too long to give up the fight now. Don’t give up. The State and County would have implemented this already if it was feasible. In my opinion, we are very past the option of doing nothing. Traffic is too heavy, too constant to make this easy commuting community without removing stoplights. Seems like we are past this point already and I am okay with that. Move on to other alternatives. NO – quit wasting our money and time. This idea is risky without support. On top of that it will be expensive. Somewhere in the middle would be the best. At the Transportation Open House meetings, each alternative was posted, and attendees were invited to vote with star and circle stickers on the alternatives they liked and disliked. Below is a tally of those votes from both meetings. 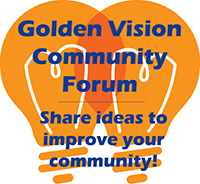 On the Golden Vision Community Forum, the public also had an opportunity to vote for the option they liked best – this option received 11 votes.